Hi everyone! I'm Laurel from Go Against The Grain and I am very excited to share with you a little bit of what I have done in the past and what I am doing this year for Halloween! 2 years ago at work we had a Halloween party where we all dressed up. One of the hardest things for me when it comes to Halloween is finding a cute costume that doesn't break the bank and actually looks good on me. 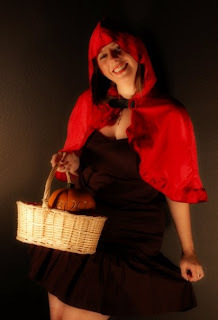 With a little searching I was able to create a costume from things I already had and went as Little Red Riding Hood complete with real basket of baked goodies. I used a little black dress I already owned, wore some red heels, used a basket I had in my craft closet and then bought an inexpensive red cape and I was all set! I took pictures of the rest of the staff too. Here are a few of my favorites. 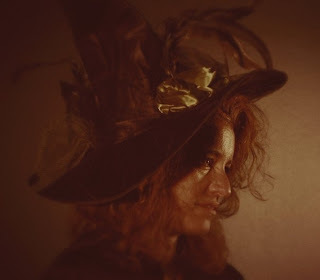 This is Wendy one of the company owners who came as a witch. 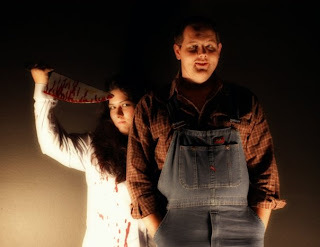 And this is my boss who came as a farmer with his assistant who shocked us all and came as a psycho killer! Since Halloween is a Monday this year I am hoping we all dress up again. I love to bake, especially cupcakes. My co workers get to reap the benefits of my cupcake baking habit as it is only me and my hubby at home, we can't eat everything I bake. Last year I made these for Halloween to take work. 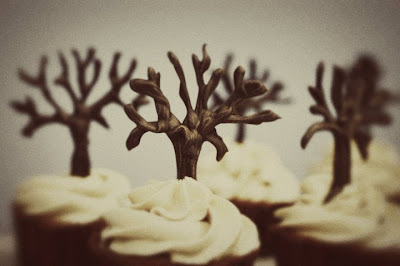 A spooky forest of cupcakes! The trees are made from melted chocolate that I piped into the tree shape. I am still trying to decide what to bake for this year. 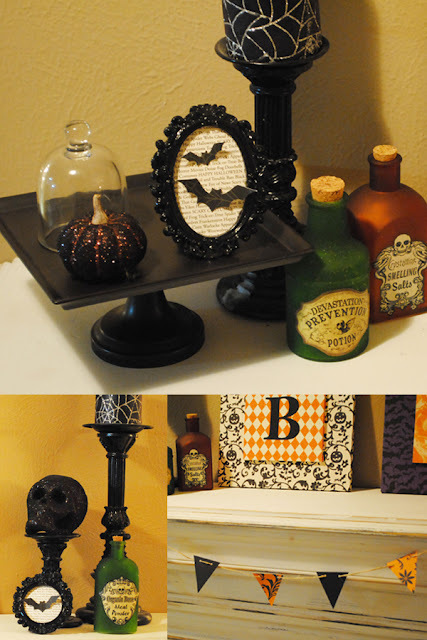 When it comes to decor for halloween I try to create my own. I just recently got my mantle display up and love how it turned out. I made the mini bunting, framed bats and large BOO letters myself. I have shared the DIY tutorial of the letters on my blog if you want to check it out here. 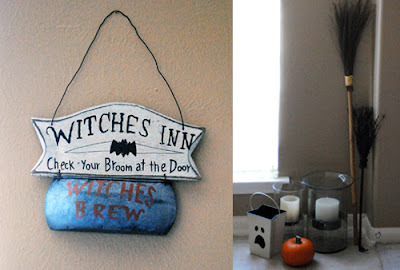 At my front door I have a little broom check in station for any witches that might stop by. And I've also got some other little things scattered around the house like these large candy corn I purchased from Etsy seller Old Goat Primitives. When I'm not baking or working at my full time job I also run my Etsy store Go Against the Grain where I create all kinds of event accessories. This year for Halloween I created some fun cupcake flags and drink flags. 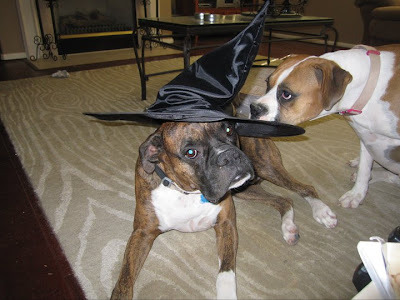 I also try to stick witch hats on my dogs... they were not amused.  Thanks so much for letting me share with you I hope you enjoyed a little look into some of what I do for Halloween! You can find me over on my blog, Twitter or Facebook! Love all the decor! 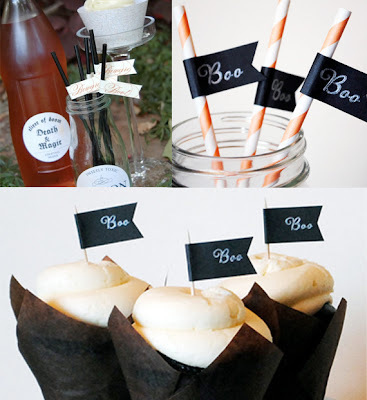 The little boo cupcake/drink tags are adorable! I'll have to keep you in mind. Looks great and I love your drink flags! Can't wait to pick up my order!! Thanks! I love the Red Riding hood, I think I may have to use it too! So inspirational! Makes me almost energetic enough to get my domestic diva apron on and try my hand at piping some chocolate trees. I'm excited about Halloween. It is the time of the year where we have a family reunion. This time is special because my sister from Ireland and his Irish husband is joining us after four years. beautiful stuff! I especially love the cupcake trees. Love that your work dresses up! So does mine--whether or not Halloween is on a work day. We have a department theme where everyone is expected to participate and decorate their cubes according to their costume selection!